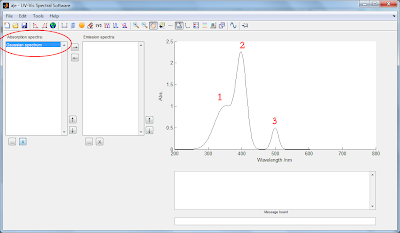 Create Gaussian spectrum - The fluorescence laboratory. Absorption and emission spectra consisting of pure Gaussian bands can be useful, for example, in order to predict an absorption spectrum from a set of theoretically calculated electronic excitation energies. 1. Go to Tools->'Make new Gaussian mixture spectrum'. 2. A dialog box will be opened asking for the details of the spectrum. 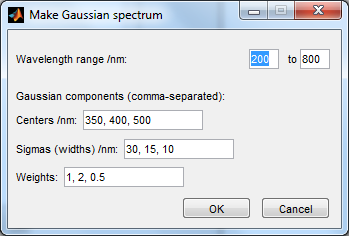 Select the wavelength range and the center, width and weight of each Gaussian component in the spectrum. Each component is separated by a ',' or a space in the edit-boxes. 1) Center at 350 nm with a variance of 30 nm and a weight factor of 1. 2) Center at 400 nm with a variance of 15 nm and a weight factor of 2. 3) Center at 500 nm with a variance of 10 nm and a weight factor of 0.5. 3. Press OK. 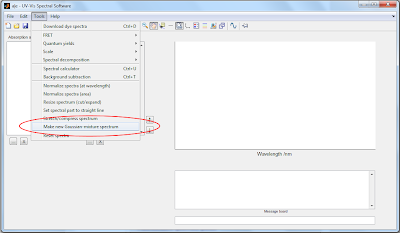 The created spectrum is added to the absorption spectra data listbox and plotted in the window.